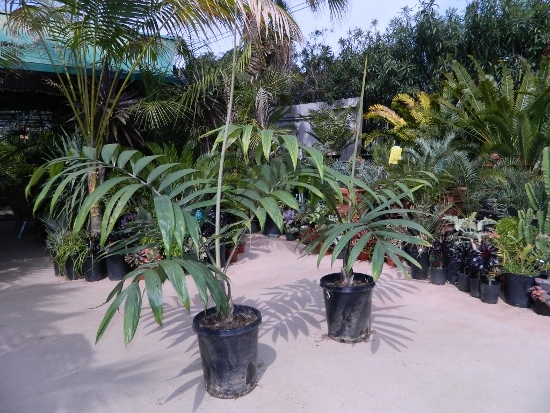 This article presents one of the most popular palm species introduced to enthusiasts in the past twenty years - Chamberyronia macrocarpa, the Flame Thrower Palm. 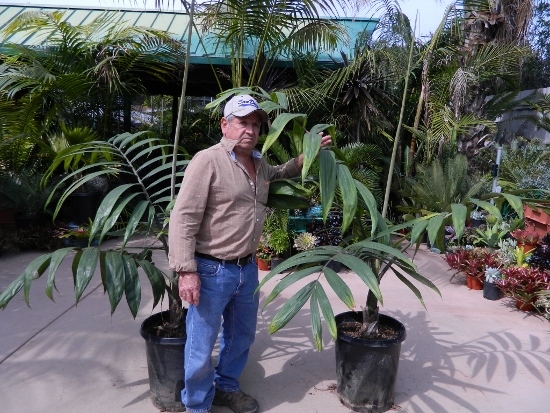 Many are successfully growing this exotic palm in Southern California. This article describes this genus, various species of the genus and gives important information about culture. 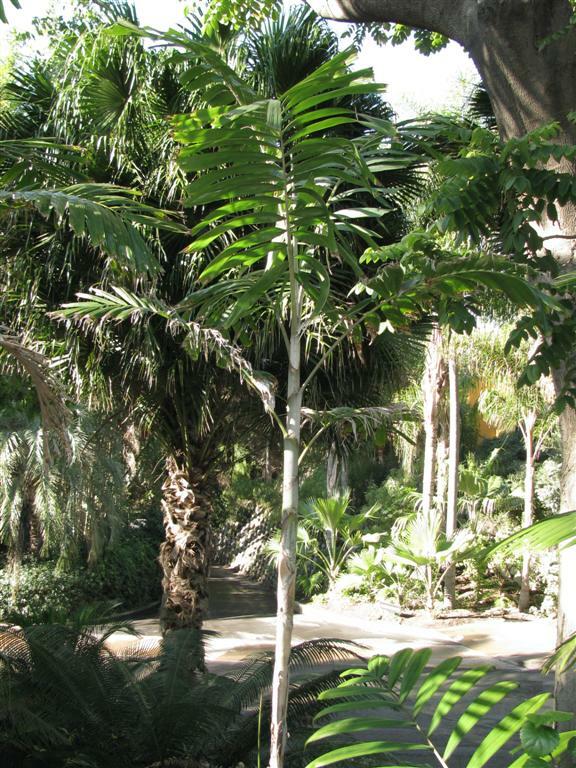 Chambeyronia is a genus of crown shafted palms from the island of New Caledonia. There are multiple species within this genus. 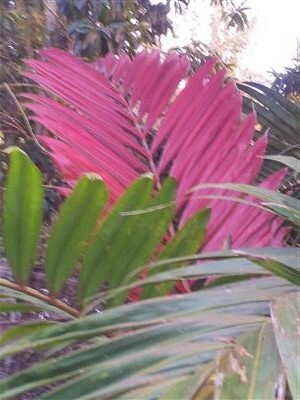 The most stunning characteristic of this genus is the color of the newly emergent leaves. For several weeks they are a red color, anywhere from dark burgundy purple to a lighter pink. 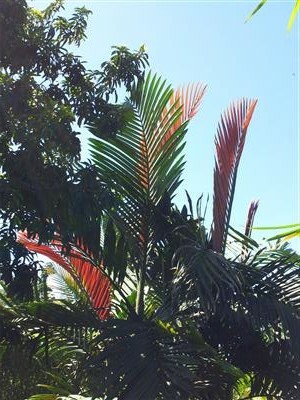 Thus, they have acquired the name of "Flame Thrower Palm". Mature Chambeyronia are a stunning addition to any landscape and have become one of the most sought after species in this country. 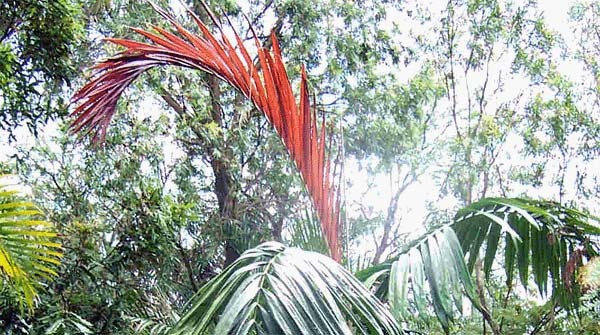 Read further to learn more about this amazing genus and see lots of pictures of those stunning new red leaves. East and north of Australia is the small island of New Caledonia. On this island there are thirty-two species of very desirable palm trees. Formally recognized, there are only two species of Chambeyronia, a genus of striking beauty for New Caledonia. This includes Chambeyronia macrocarpa. This species is from wet mountainous areas below the height of 800 meters. The other species is Chambeyronia lepidota which is native to the northeastern part of this island. Apparently the species of Chambeyronia macrocarpa was first named by Viellard in 1873. The name "Chambeyronia" honors Charles-Marie Chambeyron who lived from 1827 - 1891. He was part of the French Navy and assisted in the mapping of the coast of New Caledonia. Botanist Eugene Vieillard studied the palms on the island and named the genus. Regarding the number of different "species", further comments will be made below, although only two species are formally recognized. Of note, the origin of the common name "Flame Thrower" would be credited to Don Tollefson of Southern California in the early 1990's. 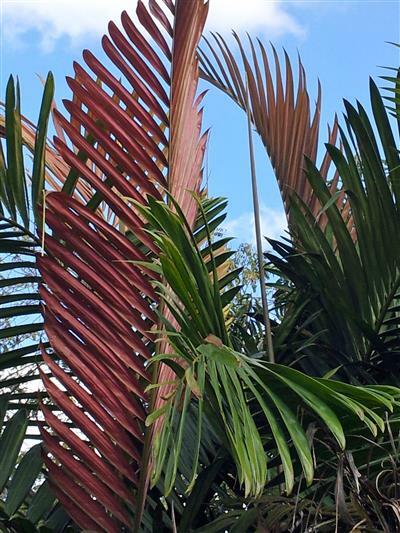 As a prototype, we'll be describing Chambeyronia macrocarpa, the most grown and sold Flame Thrower Palm in specialty palm nurseries. 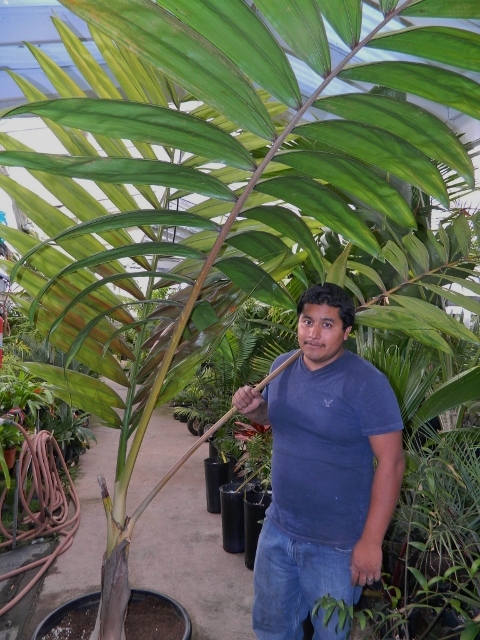 This palm is single trunk, crown shafted and has wide leaflets that have a thick texture to the touch. Average mature height of this species is twenty-five feet domestically although native plants can reach up to forty feet. Trunk diameter is ten inches. Trunk rings are lighter than the adjacent gray trunk. The crown shaft is a dark emerald green on this species (See the contrasting Chambeyronia hookeri below). 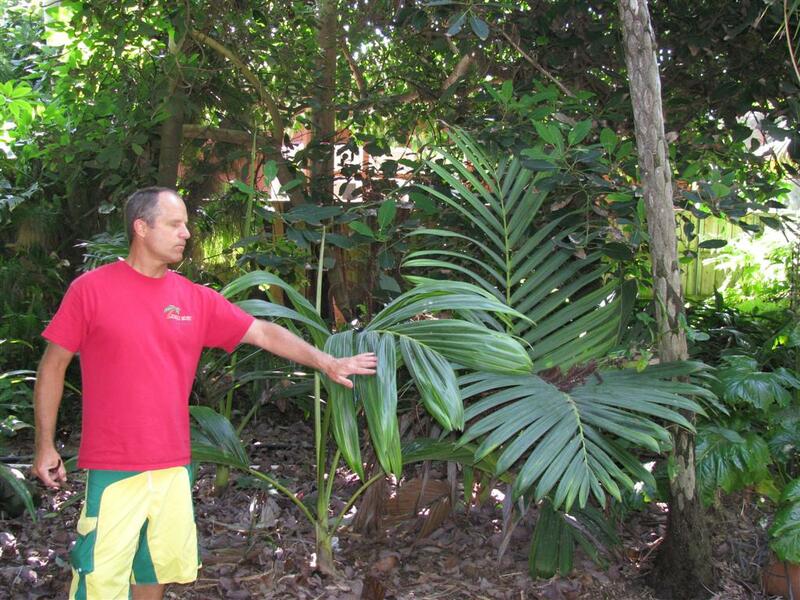 Leaves are eight to ten feet long and arching. 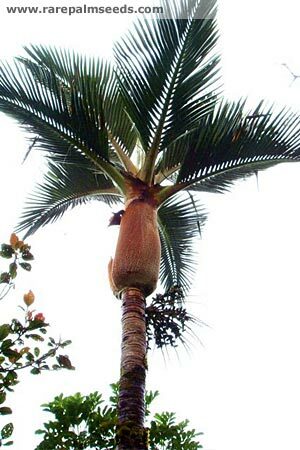 A mature tree will hold about eight to ten leaves, a relatively small number of leaves for a palm tree. The leaves are in a flat plane. Leaflets can be over three feet long, are thick in texture with a prominent central vein, and taper to a point. Seeds are red and very large, thus the species name of "macrocarpa". 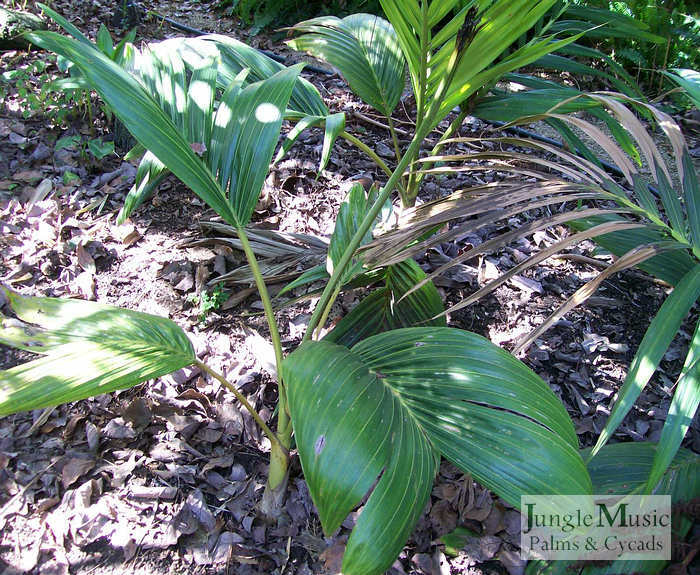 Although most Chambeyronia only throw two to three new leaves a year, each one is special. This is because they emerge with a gorgeous red color. This red varies from a deep, burgundy wine purple through all intermediate colors to an intense pink. For years, enthusiasts have argued over what causes any given plant to give the most intense color. It probably has something to do with the time of the year (temperature) and basic culture. This colorful new leaf will gradually turn to green over a 3 week period. 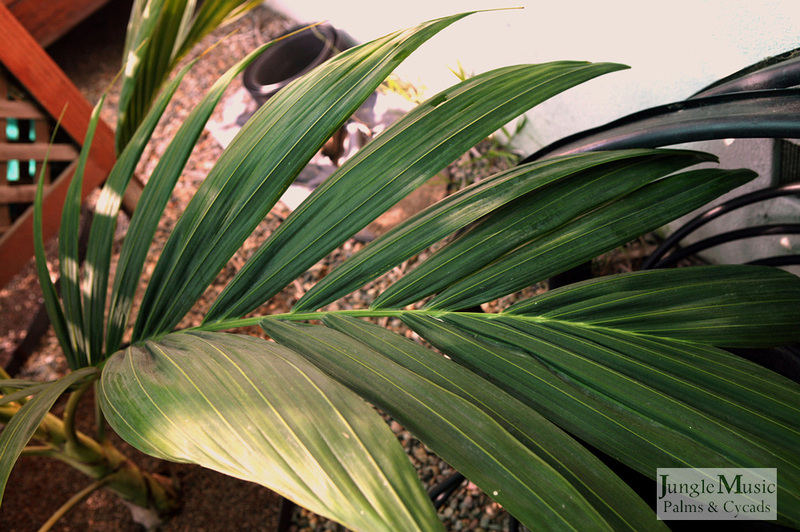 About one in twenty Chambeyronia macrocarpas put out a new leaf that is consistently green. And, there's no way to predict this. Also, be aware that the emerging new leaf color will change on sequential throws on the same plant. One new leaf might be dark purple while the next is pink. 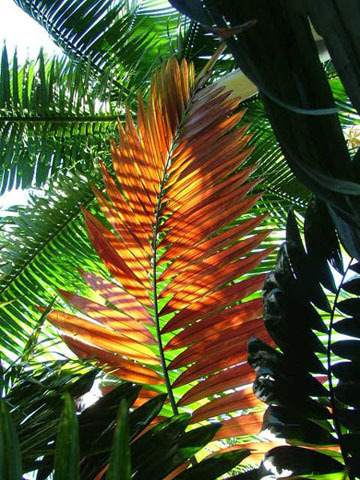 Conjecture is that this new leaf color may have some protection from scavenging predators which eat new soft leaves. Below, on the assorted photos, please realize many pictures are from new red leaves at the nursery. 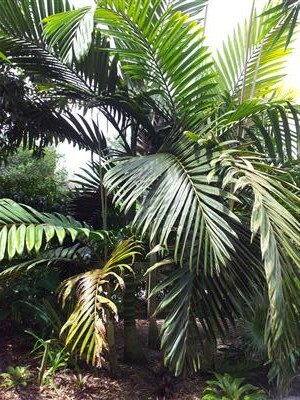 As mentioned above, the leaf of Chambeyronia macrocarpa is about eight to ten feet long when mature. 90 - 95% of trees have a colorful emergent leaf. Leaves are composed of opposing wide leaflets that are about 4 inches in width. There is a very short bare petiole. The leaf is flat in cross section. But, from a side view the leaf arches toward the ground. A typical crown holds eight to ten leaves. 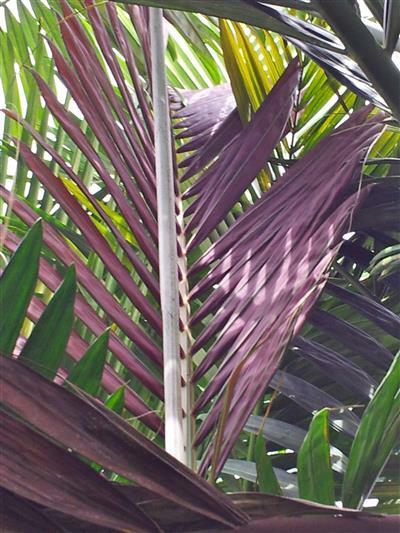 The palm's crown width is about ten feet and a similar height. Leaflets are about three feet long and come to a point. Leaflets are very thick to the touch. Trunks of the Chambeyronia are straight, smooth, prominently ringed and about 8 to 10 inches in diameter. In the shade, trunks that do not see direct sun are green with lighter colored growth rings. In sun, trunks will produce "bark" and are brown or tan in color. For uncertain reasons (probably genetic markers), some trunks show what's called the "watermelon" feature. This is a marbled white on the green of the trunk and crown shaft area. Some feel this could be because of hybridization of the C. macrocarpa with the C. hookeri. (discussed below). In any case, it is more prominent on some plants, less on others. And, there seems to no way predict if you plant purchased small will have this trait unless it came from "watermelon parents". But, even so, it's no guarantee. Photos below show you a typical trunk and some with this watermelon feature. THE CROWN SHAFT OF THE CHAMBEYRONIA - AND "CHAMBEYRONIA HOOKERI"
A crown shaft is composed of the old leaf(s) bases. It's the smooth structure directly below the oldest leaf. 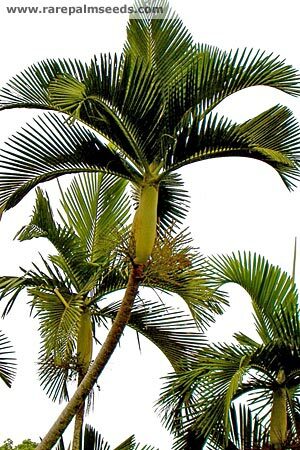 If you are a palm enthusiast and reading this article, undoubtedly you said to yourself "what about Chambeyronia hookeri". Being a nurseryman, I have always approached this genus with the understanding that Chambeyronia macrocarpa and hookeri were two distinct species. On the former, the crown shaft is dark green, almost a black-green. On C. hookeri, it is tan, cream or yellow in color. Photographs below will demonstrate the difference. But, the taxonomist, because the flowers are the same or similar, will not divide the two into two different species. On either, the crown shaft is about three feet long. It bulges somewhat. It is totally smooth except for bulging from the eruption of flower spikes. And, of course, the old crown shafts fall off naturally with this "self pruning species". Flowers emerge below the crown shaft and are branched and about a foot long. The flowers themselves are green and white. 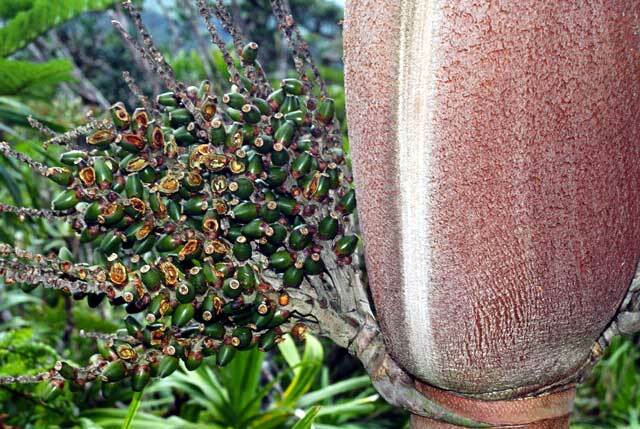 This is a monoeiceous species and you only need one tree to set seeds. 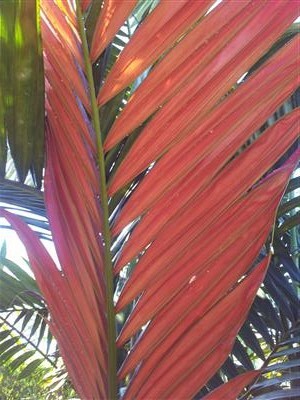 Fruit color begins green and at maturity is prominently red in color on C. macrocarpa. It would not be unusual to see a tree holding flowers with seeds at various points of maturation, some green and some red. (see photos below) Fruit size is 1.5 to 2 inches. After removal of fruit, seeds are somewhat smaller. Fruit shape is similar to an egg; slightly longer than wide. Enthusiasts would most likely add two additional species. These would include Chambeyronia hookeri and Chambeyronia houailou. I will make comments on these below. But, be aware that in habitat, reports have been made for Chambeyronia of extreme height (up to 90 feet tall) as well as short, stout plants. The watermelon characteristic is seen in the wild but is quite variable. And, so are the variations of crown shaft color including some that (in habitat) are almost white. These are all felt to just be variations of Chambeyronia macrocarpa. This species of Chambeyronia is not as tall as C. macrocarpa, usually maturing at a height of 30 to 35 feet. 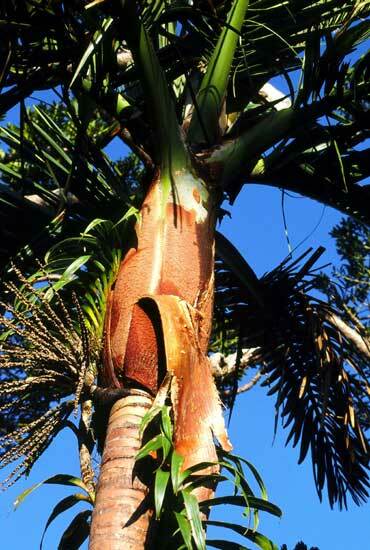 Also, the trunk of C. lepidota is thinner, typically six inches in diameter. The crown shaft bulges at the bottom and is covered with tomentum giving it a red-brown appearance. Leaves are shorter than macrocarpa, typically only six feet long. And, they are strongly arching, more than the macrocarpa. Leaves are also keeled (V-shape in cross section). There is mention that there is a "high elevation" and "mid-elevation" form of this species with some morphological differences. This species is known to occur up to 4500 feet in habitat. Culturally, this species is much slower and more difficult to grow. It is also rarely available on the market. If you read above and look at the photos above, most of them are of the major species of this genus, Chambeyronia macrocarpa. So, descriptive information is already given. I will show two more photos of this species. Photo from Rare Palm Seeds, T.S. I discussed this palm above and it's questionable status as a true species. It is identical to Chambeyronia macrocarpa except for the color of the crown shaft. 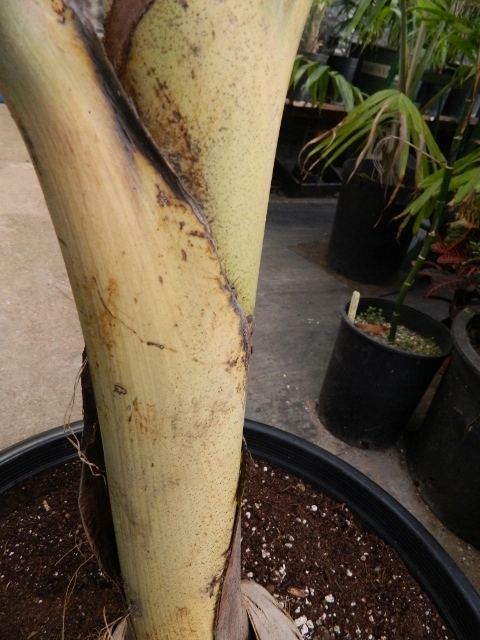 This palm has a yellow to light tan colored crown shaft. But, remember that Chambeyronia macrocarpa is quite variable in habitat in terms of its appearance and overall size. Regardless, this palm with the yellow crown shaft is truly stunning and gorgeous. It is highly sought after by enthusiasts. It also throws a new red leaf. There may be minor cultural differences between this species and the macrocarpa. For additional photos please see pictures above under "crown shaft". 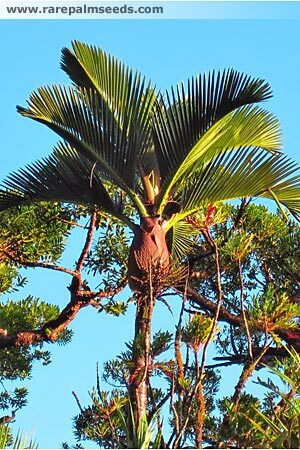 On the eastern coast of New Caledonia near the native habitat of Kentiopsis, a variety of Chambeyronia exists that is sought after by enthusiasts and at one time was felt to possibly be a different species from C. macrocarpa. It is called "Chambeyronia houialou" because its locality is in the Houialou Valley. When first introduced, the main difference of this variety was that it was noted to appear different at a juvenile stage. It maintained a simple leaf much longer (didn't go pinnate as soon, a cultural difference) and when larger sported a yellow-green crown shaft and had more of a keeled leaf than the regular macrocarpa. The newly emerging leaf appears more similar to Kentiopsis oliviformis in color with a light orange-red color or sometimes a blue look. This, of course, is variable plant to plant. Taxonomists feel, however, that it is not a distinct species. Some conjecture that it looks possibly like an intergeneric hybrid with Kentiopsis. 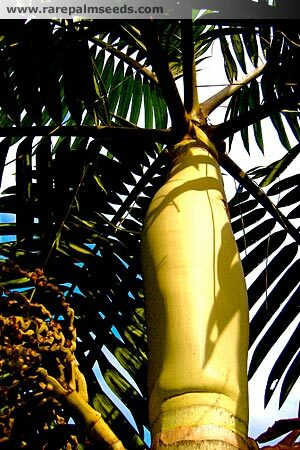 I wish to thank Rare Palm Seeds for the fantastic photographs below in habitat of this great palm. Chambeyronia lepidota: No common name although many years ago known as the "Champagne Palm"
One must understand that, when growing any Chambeyronia, that growth rate is slow. An average plant, whether in a container or in the garden, will usually put out two leaves a year and possibly three. As soon as the new leaf opens, you'll see the red color. This fades over about a two to three week period. The leaf then converts to green. Plants grown in filtered light tend to have a darker green color to the leaves. Those grown in full coastal sun are a lighter color of green. More importantly, we've found that, right along the coast, plants grown in sun tend to grow faster and develop more quickly a fat base of the trunk. Chambeyronia lepidota is unbelievably slow growing. Chambeyronia hookeri grows about the same speed as macrocarpa. Ten years ago most growers felt that Chambeyronia was only destined for filtered light. Through trial and error, it has become known that Chambeyronia macrocarpa adjusts to and easily tolerates full sun along the coast. By the "coastal", I mean within six or eight miles of the ocean. Further inland areas probably require part day sun protection. And, intensely hot areas would demand this species be grown in filtered light only. Like almost all New Caledonian palm trees, this species really appreciates adequate water. The number one cultural problem experienced by enthusiasts has to do with the restriction of water. So, if you are growing a Chambeyronia and having trouble, the first thing you do is give it more water. But, as it's a slow growing species, it might take three to six months before you see an improvement. This genus does not do well with water restriction. Chambeyronia appreciate a rich, well draining soil. If your soil is heavy clay, try supplementing your native soil with coarse sand and organics. If you have a super sandy soil, add organics such as fir or redwood shavings to your soil. 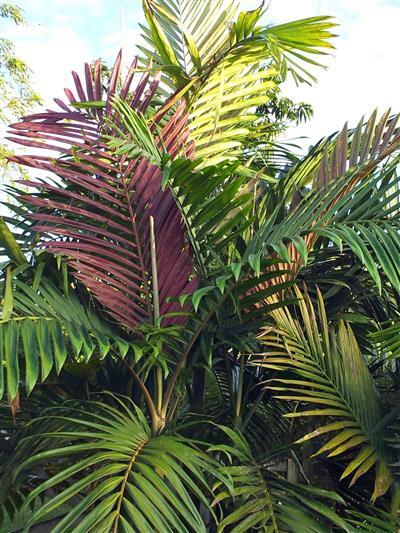 As with many palms, it is important to remember that too much fertilizer can burn the plant. So, it's best to use a slow release preparation and make sure you never fertilize on dry soil. Organic preparations are probably safer. And, as Chambeyronia love water, make sure you always give adequate watering after you apply fertilizer. Chambeyronia macrocarpa tolerates temperatures down to about 23 degrees F. As far as we know, it doesn't survive into the teens. If you have adequate humidity, temperatures as high as one hundred degrees can be tolerated. About fifteen years ago we were surprised to learn that Chambeyronia does fantastic as a house plant. 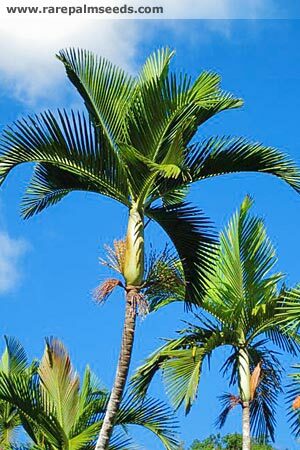 I'd estimate they are as easy to grow as a Kentia Palm. And, they do have their red emergent new leaves inside the home. Customers at the nursery as well as by mail order are always interested in seeing what nursery grown Chambeyronia look like. Therefore I am going to show you an assortment of potted plants from the nursery. Sizes will be given below each picture. All of these plants are usually available and can be either shipped, delivered or picked up here at our facility. Availability can change over time. Chambeyronia is a genus of two species with two other variations that may some day be considered to be a species. All are form the island of New Caledonia. The main species of this genus is Chambeyronia macrocarpa. 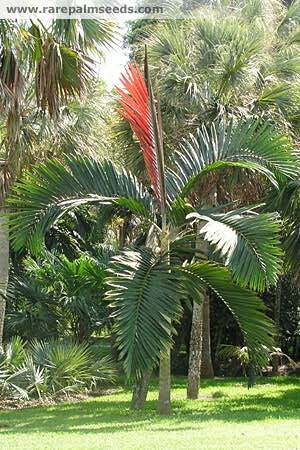 It is also known as the Flame Thrower Palm. 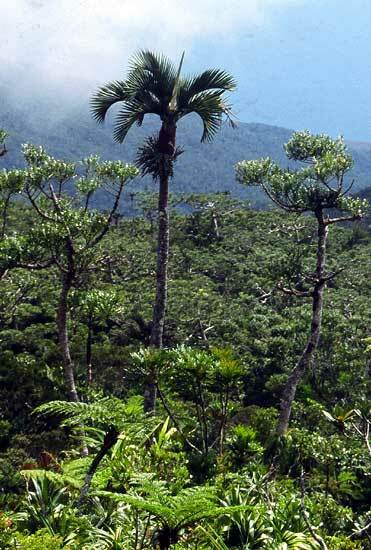 All species of this genus are medium to tall pinnate palms with crown shafts. They are self pruning in that their leaves fall to the ground when dead. Crown shafts are of variable color, dark green being the most common. Chambeyronia hookeri has a yellow or tan crown shaft. 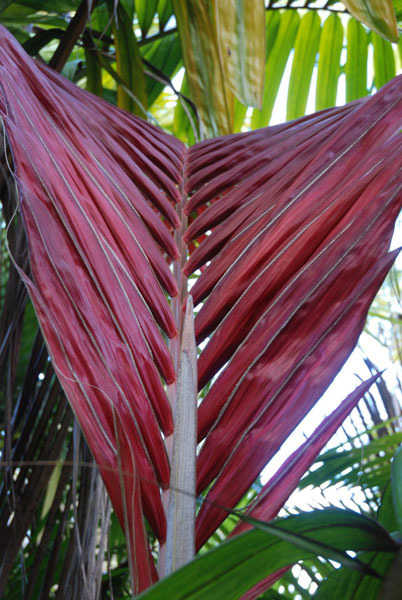 Chambeyronia lepidota bulges and is red-brown and is also a smaller palm. All species of the genus prefer adequate water and along the coast some may tolerate full sun. Growth rate is slow on all type of Chambeyronia. I would like to thank the following individuals or entities for their contributions to this article, either in the way of photos or information.